yLooking for new ways to repurpose what you already own? Pull out those old pieces of silver from the cabinets, give them a quick polish and put them to use! This trend has become popular for brides and homeowners alike. Arranging flowers in vintage teapots is a great way to add elegance to any occasion. Filling vintage items, found around the house, with flowers is a great way to repurpose them. I recently wrote a tutorial about using a silver punch bowl to create a centerpiece HERE. Brides can easily find silver teapots at thrift stores, garage sales, and antique markets. Low enough to allow easy conversation, an arrangement in a silver teapot creates an ideal tablescape. Choosing a variety of teapots with similar shape and size, and filling them with flowers makes stunning and elegant centerpieces. How cute would it be for a flower girl to walk down the aisle with her little hands holding the handle of a teapot filled with flowers? 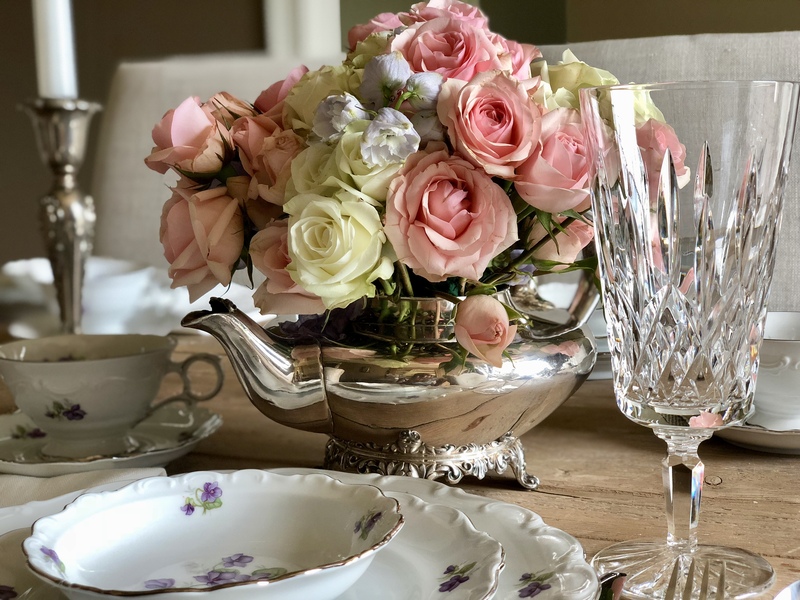 Besides being used in weddings, a silver teapot or coffee pot centerpiece can be used at home on your table for a special occasion, such as Mothers Day, a romantic dinner for two or when guests come over. If using as a centerpiece on a table, Silver pairs beautifully with crystal stemware such as Waterford HERE and crystal accessories HERE. Another great use is to gift these beauties to special people in your life (mothers, grandmothers, and aunts), creating lasting keepsakes they will cherish forever. Use a container that is at least 3″ deep. To make your centerpiece truly stand out, give your piece a quick polish before using. It’s okay to have a little patina on the teapot, it adds character and looks pretty. Use wet floral foam to give the flowers stability. Slice off the square corners of the foam and soak it in water. Make sure it comes an inch above the rim when placed in the teapot. Build from the outside in, intersperse spray roses around the base of the arrangement. Place roses in your teapot in sets of three. Continue to add roses filling in the gaps. I added a bit of Delphinium to the arrangement for color and to create a fuller appearance. I love the way my teapot arrangement looks on our table. It is easy, fun, and a pretty way to dress up a table for any occasion. Go on! Give it a try with your silver pieces! Don’t have any, check this one out HERE. For more flower inspiration, subscribe to Happy Haute Home and follow along on Pintrest HERE, and Twitter HERE and feel free to pin and tweet your favorite pics from Happy Haute Home. It is such a great idea, I really love it too! Thanks Ingrid! Roses and silver….my favorite. Love your blog! Roses and Silver. My favorite floral design. Thank you for sharing. I love your blog.